A look at how the cigarette industry kickstarted modern advertising, and its impact upon Australian culture and health. Its semiotics. Counter responses from Government and health agencies, and the sustained market share of Big Tobacco in the absence of traditional advertising expenditure. Advertising is a communications tool, primarily visual in nature, serving to convey information to persuade and inform the public – usually, but not exclusively, on behalf of commercial enterprises seeking to consolidate or expand their market-share in a given field. It has deep roots in the history of human trade, commerce and consumption, with instances of the promotion of goods or services being identified as early as Egyptian and Roman times (Williams, 1980; Warren, 2001). As society, culture, models of government, and industrial practices have changed over the centuries, so too has advertising evolved in response to these shifts. Suffice to say, by the dawn of the 20th century, the war for the hearts and minds of the international consumer dollar had begun in earnest, and advertising rapidly became both more prevalent and sophisticated. Cigarettes, in particular, came to be ‘portrayed as the ultimate product of the modern age, offering instant pleasure and relief from the stresses of everyday hectic life’ (Gifford, 2010). Indeed, advertising and tobacco have long been ‘intimately intertwined’ (Studlar, 2002) in the contested ground of ‘capitalist production, distribution and market control’ (Williams, 1980). Even as the risks of tobacco products became definitively established, the challenge to government and public health campaigners to overcome the pervasiveness of generations of cigarette advertising and consumption has been, and continues to prove, considerable. It quickly became evident that ‘those concerned to oppose commercial versions of the world must pictorialize their arguments through images… according to much the same principles as those employed by the enemy’ (Goffman, 1979). This essay will briefly examine the typical characteristics of mid-to-late 20th century tobacco advertising, referencing Chapman and Egger’s semiotic analysis of a notable 1970s campaign by top-selling Australian brand Winfield. It will then turn to a consideration of government-led counterpoint advertising in Australia, specifically the Quitline National Tobacco Campaign 1997-2005, to determine the success of the ‘messages’ it targeted at the consumer (or potential consumers) of tobacco products, and identify the recent strategy it has adopted in 2011 in light of questions being raised over the long-term efficacy of fear-based advertising. As early as the 1960’s, Australian government agencies were cognisant of the need to limit the impact of tobacco-related advertising upon the consumer population, where the prevalence of consumption in Australia in 1964 was as high as 58% amongst men over the age of 16, and 28% amongst women (Scollo and Winstanley, 2008). Melanie Wakefield, director of the Centre for Behavioural Research in Cancer (Cancer Council of Victoria), cites a 1967 audit by the Anti-Cancer Council of Victoria that revealed the ubiquity of tobacco advertising on Australian television airw aves, with one cigarette commercial screening every 12 minutes on Melbourne television. The audit also noted the typical themes prevalent in the advertising, highlighting the qualities of the products in regards to their size, flavour, whether they were mild or smooth, or bore filters (Wakefield, 2005). This was certainly part of the strategy employed by Australian advertising agency Hertz-Walpole in their 1972 campaign for Winfield, featuring comedian Paul Hogan as a ‘suave, sophisticated man about town.’ In a cinema variant of what would also appear in print, Hogan, seated in a tuxedo before an orchestra, draws out a packet of Winfields. 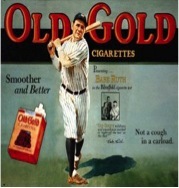 After mentioning the price of 40 cents (with the observation “that’s about the price you should be paying for a good smoke”), he goes on to draw attention to the length of the cigarettes contained within, and their standard – “mild, quality all the way.” In short, claims Hogan, “it’s a good tobacco”. Far more influential upon the minds of the audience, however, was the sense that ‘one of us’ was addressing the public directly. Not only did the campaign breathe life into a besieged Australian advertising industry, it catapulted sales and elevated Winfield tobacco to the country’s number one cigarette brand. In the words of Hertz-Walpole copywriter Alan Johnston, ‘the time was ripe for something uniquely Australian’ (Crawford, 2008). Clearly, this emphasis upon a nominal Australian identity was instrumental to the Winfield campaign’s success. Chapman and Egger identified some of the basic characteristics that they argued were universal to print tobacco advertising in a 1983 essay, which utilised a structuralist, semiotic analysis that encompassed Saussure’s insights on signs and signifiers, Langolz Leymore’s application of the Exhaustive Common Denominator (ECD), and Barthes’ observations on the influence of appeals to mythology in the perception of social distinctions. Chapman and Egger’s analysis was broken into categories that covered the campaigns’ specific signifiers, mythological appeal, ‘problems’ and ‘promises’ posited by them, and the binary opposites they contained, and while the categorical specifics of each competing campaign differed according to the market sector being targeted, they all shared the same ECD – that the individual who smokes brand x is a ‘winner’, while those who partake of any other brand are invariably ‘losers’ – the polysemic nature of their differing compositions had all seemingly been tamed to a single, shared message, irrespective of brand. Chapman and Egger revealed that the persuasive components of tobacco advertisements weren’t just about the relative, material qualities of the tobacco in question, but something more psychological – the appeal to the subconscious idealism of the consumer. In the later taxonomy of Leiss and others (COMM120, 2012), the print derivative of the Winfield campaign embraces the Associative qualities of a laconic sophistication married with adventurism, combining two very different metaphors into a single message – Hogan in a tuxedo before an orchestra, juxtaposed with scenes from an active, healthy escapism. The consumer audience is left in little doubt that a rich, full life can be had and that Winfield embodies this possibility. The advertisement also carries qualities typical of the Affective, or personalised, format. A direct relationship is drawn between a likeable, accessible celebrity and the Winfield brand, where ‘the celebrity as icon merges with the product, personalising it and investing it with the halo of success and glamour’ (COMM120, 2012). In this instance, Hogan embodied ‘national traits of toughness, realism, acceptance of life as it really is, humour and a good-natured disdain of authority’. As such, he was ‘what we want the Australian to be’ (Crawford, 2008), and that projected self-image would perhaps prove the biggest obstacle for opponents of tobacco advertising to overcome. The Hertz-Walpole campaign for Winfield came about amidst strengthening opposition to tobacco advertising across all mediums. The ALP had already, as of 1971, adopted as part of its platform the outlawing of cigarette advertising (Crawford, 2008). But it would take many years to reach its legislative fulfillment, and even as advertising disappeared from print and television (the latter phased out in 1976), campaigns tied to that other quintessential element of the Australian identity, a love of sports, did not completely cease until 2006. A significant challenge for anti-smoking campaigners was in overcoming the ‘positives’ that tobacco advertisers had established in the minds of audiences, where ‘on a social level, the promotion of consumption in many ads over time leads to a representation of goods as the solution to all of life’s problems, and the way to achieve the “good life” of happiness and success’ (Pollay, in Phillips 1997). Government had begun to recognize that legislation alone would not entirely eliminate the cumulative effect of years of advertising of a product that, by its very nature, compelled future consumption through its addictiveness. As such, they moved to embrace the weapon of choice for the tobacco industry – advertising. Following early trials run in the 1980’s across a number of states, it became evident that anti-smoking advertisements had the potential to compete ‘favourably with tobacco advertising to reduce consumption’, and further influence tobacco policy at the Federal level (Wakefield, 2005). An early example of such a campaign is cited by Chapman and Egger, who analysed a NSW North Coast Healthy Lifestyle advertisement targeted at adolescent audiences, and found it effective in flipping the ECD from the typical ‘smokers of brand x are winners’, to ‘non-smokers are winners; smokers are losers’ (Chapman, Egger, 1983). Such early successes led to the adoption of a National Tobacco Campaign (NTC) in 1997, which featured the tagline “Every cigarette is doing you damage”. The intended audience were smokers aged 18-39 and blue-collar workers, and the composition of the NTC advertisements were based upon the following provocations suggested by cigarette consumers surveyed following a previous Quit campaign: that they wanted to quit and regretted starting smoking; that they wanted to be told something new; and that they wanted to be shocked. The campaign also determined that there needed to be an empathetic quality to the advertisements that personalised them for the intended recipients; that the material should present new information; and that attention must be directed to ‘certain effects rather than possible effects’ (Wakefield, 2005). UNABLE TO FIND MATCHES, A YOUNG MAN LIGHTS HIS FIRST CIGARETTE OF THE DAY FROM THE STOVE. AS HE INHALES, WE FOLLOW THE SWIRLING SMOKE PAST HIS LIPS AND DOWN HIS TRACHEA. VO: Every cigarette is doing you damage. AGAINST A DARK BACKGROUND WE SEE A SECTION OF HUMAN AORTA ON A KIDNEY DISH. This is part of an aorta, the main artery from the heart. A DOCTOR’S HAND PICKS IT UP AND SQUEEZES ALONG ITS LENGTH. YELLOW CHEESY ‘GUNK’ COMES OUT LIKE TOOTHPASTE. Smoking makes the artery walls sticky and collect dangerous deposits. AS OUR SMOKER EXHALES, WE REVERSE BACK UP HIS THROAT TO SEE HIM PUFF AWAY BLISSFULLY UNAWARE. Every cigarette is doing you damage. SUPER: EVERY CIGARETTE IS DOING YOU DAMAGE. QUIT 131 848. A FEDERAL, STATE AND TERRITORY HEALTH INITIATIVE. These advertisements defy easy categorisation, as they work to de-mythologise a product to reveal the risks of consumption and subvert the associative and lifestyle messages communicated by the tobacco industry over generations. In the above example, however, what is evident is a sophisticated combination of rational, information-based advertising in line with a Utilitarian perspective (the act of cigarette consumption tied to the perspective of a doctor conveying the effects of such consumption); an Associative dimension that establishes the context of the message through semiotic utilisation of colours (yellow, grey, black) indicative of disease, married to a representation of surgical procedure (the removal of an aorta from the deceased); and, finally, elements of the Combinative approach, where the product and the consumer are situated within the wider social matrix (COMM120, 2012) suggesting by implication the efforts of the health system against smoking-related disease, and the tragedy of premature death. 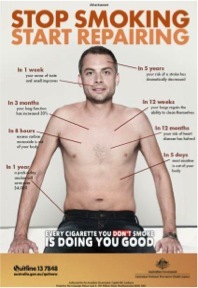 In line with research that showed anti-tobacco advertising has ‘rapid behavioural effects that decay quickly’, the initial campaign was followed by further ads that prompted recall and reinforced the graphic consequences of cigarette consumption, with continued emphasis on the damage to major organs resulting from smoking. Follow-up research by the Cancer Council of Victoria revealed that after 3.5 years, there was a continued high recognition of the campaign advertising, that there was evidence suggesting the new information presented had been absorbed to a noticeable degree, and that the campaign had effected a continued decline in smoking prevalence (Wakefield, 2005), indicating that the initial criteria suggested by surveys prior to the launch of the campaign had been successfully fulfilled. In addition, legislation was enacted that made mandatory the presence of graphic images from the campaign on cigarette packet warning labels. Chapman and Egger had earlier highlighted the risks of blowback from the young. They observed that ‘(a)dolescents know from their own experience of smoking that its adverse consequences will arrive, if at all, in the distant future’, citing Thompson’s contention that ‘rational information-based appeals aimed at preventing smoking amongst adolescents will not succeed’ (Thompson, 1978), and cautioned that ‘appeals directed at the young need to be more concerned with image and less with knowledge’ (Chapman, Egger, 1983). However, Wakefield argued that the NTC advertising resonated even outside its specified target audience, and spoke also to young and potential smokers. The campaign presented a strong argument of a direct causal connection between consumption and a severe impact upon health, conveyed through extremely graphic images that served to reinforce the information communicated. Indeed, in 1998, research revealed that in a survey of 400 adolescents that had been exposed to the campaign, 84% of teen smokers thought the ads relevant to them, 33% claimed it discouraged some friends from smoking, and 85% of respondents said the campaign made smoking seem less ‘cool’ and desirable. In 1999, in a larger survey of 3714 teens, 8% of teen smokers said the ads had helped them to quit (Wakefield, 2005). Fear and its incitement play a critical role in the campaign examined above. One problem that has been identified, however, in the utilization of fear in such a manner, is that ‘ads that provoke fear, guilt or anger are by definition aversive, and risk prompting consumers to ignore the ad’ (Cott, Ritchie, 2005). Cott and Ritchie argue that studies into the effects of fear-based advertising are inconclusive, with the appeal to fear and shock enhancing persuasion in some instances, while attenuating it in others. They cite Keller and Block in observing that ‘strong fear appeals may fail if they induce too much elaboration of those consequences and thereby deter consumers from recognizing the solution offered in the ad’ (Keller and Block, in Cott and Ritchie 2005). Indeed, fear-based campaigning is a contentious issue. Writing in Salon, Mary Elizabeth Williams argues such messages ‘may not even be effective’, and refers to the findings of Martin Lindstrom that vivid anti-smoking warnings can actually ‘increase cravings in smokers’ brains’ (Williams, 2010). In presenting findings about the impact of marketing upon neurological functions, Lindstrom cites fMRI evidence suggesting that cigarette warning labels appear to activate the nucleus accumbens – a complex region of the brain that not only has a role in processing fear, but also pleasure, reward, and addiction – to generate cravings in response to the graphic imagery of anti-smoking advertisements and warning labels (Lindstrom, 2008). Sustained exposure to fear-based campaigning also risks desensitization, with Cott and Ritchie finding that ‘failure to vary the type of emotional appeal used could actually contribute to consumer desensitization to certain images and forms’, and that ‘negative-emotion appeals had to be paired with a relevant message in order to succeed in inducing the desired behavior among consumers, especially when such behavior was to be sustained over time’ (Cott and Ritchie, 2005). There appears to evidence, too, ‘that the Australian tobacco market actually grew by 2.9 per cent between 2004 and 2008, despite an increasingly inhospitable marketing environment’ (Campbell, 2010). Examining data from four Australian National Health Surveys, Julian de Meyrick of Macquarie University found evidence suggesting that the decline in tobacco smoking may have stabilized at approximately 20% of the adult population, and that changes in smoking habit across the population of Australian smokers have not been consistent despite ‘all segments being exposed to the same fear-based strategy’. De Meyrick asserts that ‘if smoking prevalence is to be eradicated in Australia or other similar markets, campaigns must address cessation and prevention.’ (de Meyrick, 2010). It is a message that the NTC seems to have anticipated, with their most recent campaign (2011-2012) reflecting a shift in tone distinct from the outright shock effects of previous efforts. “Every cigarette is doing you damage” has now been paired with a corollary message – “Every cigarette you don’t smoke is doing you good”. A healthy-looking man and a healthy looking woman feature in gender-specific variants of the same ad. We are presented almost purely Utilitarian composition, that nonetheless encompasses the Associative and Combinative dimensions through its use of neutral colour tones and the relaxed determination in the faces of individuals, who appear convinced that their decision to quit was the correct one. The capacity of the body’s self-repair mechanisms are highlighted and the information presented in a clear, concise manner. ‘If we’re talking about promoting health’, asks Williams, ‘why not encourage more healthy tactics?’ (Williams, 2010). The 2011-2012 campaign, therefore, has the effect of saying to the smoking audience that good health is possible, circumventing the potential fatalism that may have been engendered by previous campaigns. While advertisements for Nicotine Replacement Therapies such as Nicorette have employed this strategy in the past to good effect, Geer and Ryan assert that the Government has not previously been successful in this approach, and that the cited examples from the current campaign are to be especially applauded. They consider the advertisements ‘a prime example of a campaign that has taken the traditional category communication and flipped it on its head – to great success’ (Geer and Ryan, 2011). Indeed, the above examples appear also to succeed in satisfying an implicit demand identified by Schudson, when he highlights the desire that we ‘would all like to be the person and live the life that we see in advertisements’. He observes that ‘on some level, consumers know that ads idealize and falsify reality, but on another level, they know that such a reality is at least a possibility’ (Schudson, in Phillips, 1997). Such campaigns remind us that ultimately, the capacity for meaning-making, identification, and self-determination on the part of audiences cannot be underestimated, and that these qualities are often simply awaiting encouragement. Despite the outright ban on cigarette and tobacco advertising imposed by the Australian government via the Tobacco Advertising Prohibition Act of 1992, and the continued efforts of anti-tobacco advertising, tobacco products continued to occupy six of the top ten selling ‘grocery’ items in Australian households, over ten years after the legislation was introduced (Top Brands, 2008). Top Brands ceased representing tobacco companies in its research in subsequent years, eliminating a key indicator of consumption from its measurements and making observance of contemporary positioning of tobacco in our markets more opaque. Reflecting a long-term trend acknowledged by a 2006 report that consumption has effectively stabilized despite anti-tobacco campaigning, British American Tobacco (Winfield, Benson & Hedges, Holiday), Imperial Tobacco (Horizon), and Philip Morris (Longbeach, Peter Jackson) continued to generate in excess of 2.25 billion dollars annually in Australia, despite zero ad-spend (Neilsen, in Ad News, 2006). Chapman, S & Egger, G (1983). ‘Myth in cigarette advertising and health promotion’, in Davis, H & Walton, P (editors) Language, image, media, Blackwell, Oxford. COMM120 Lecture 8 – Advertising: The Magic System 2012, Griffith University, Brisbane. Cott, June & Ritchie, Robin (2005). ‘Advertisers’ Theories of Consumers: Why Use Negative Emotions to Sell?’, Advances in Consumer Research, Volume 32. Crawford, Robert (2008). But Wait, There’s More… A History of Australian Advertising, 1900-2000. Melbourne University Press, Melbourne. Davis, Howard & Walton, Paul. (1983). Language, image, media. Oxford, Blackwell. Chapman, S & Egger, G (1983). Myth in cigarette advertising and health promotion. Goffman, Erving (1979). ‘Gender commercials’, in Gender advertisements. Macmillan, London. Lindstrom, Martin (2008). Buyology, Doubleday, New York. Meyrick, J (2010). ‘Tobacco smoking’s changing trajectory in Australia’, Journal of Business Research, Volume 63, Issue 2, February 2010, Pages 161–165. Phillips, Barbara (1997). ‘In Defense of Advertising: A Social Perspective’, in Journal of Business Ethics 16: pp109–118. Scollo, MM and Winstanley, MH (2008). 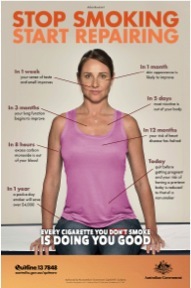 Tobacco in Australia: Facts and Issues. Third Edition. Melbourne: Cancer Council Victoria; 2008. Williams, Raymond (1980). Problems in materialism and culture : selected essays. London : Verso.